Our bulk change features allows you to change the field values for both custom fields and system fields such as content type and initiative associated with multiple content assets all at once. This feature is available in the content catalog in Studio as well as in the manage content area of Gallery. 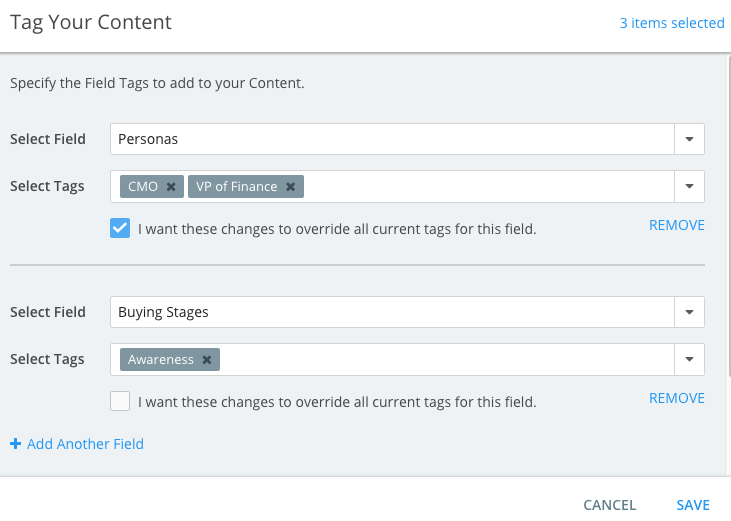 Tag or re-tag content when a field or field value is added such as new Personas, Buying Stages, Initiatives or a custom fields specific to your business. Clean up data tagged on Content Assets where values have been missing or incorrect. Make Content Assets easier to find for your audiences in the Gallery by adding appropriate field tags. 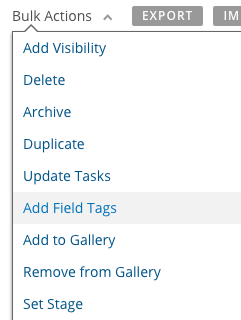 There is a None filter in the Manage Content section of Gallery for all Field Tags. Clicking on this filter will display all content that has not been tagged with any value from that Field Tag. This option only applies to multi-select fields as single-select fields will always override because there is only one option that can be selected for single-select fields. Log into Kapost and navigate to the content tab in Studio from the side navigation bar. Filter to find content assets that should be bulk tagged. 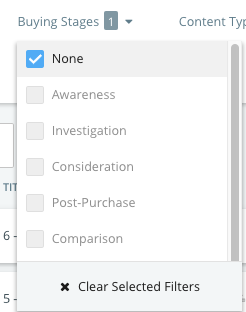 Select the checkbox next to the content assets that should be bulk tagged. 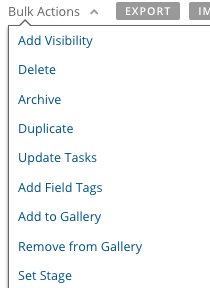 Click the Bulk Actions dropdown menu. Select as many fields and corresponding values as desired. Log into Kapost as an Admin and click Gallery on the top navigation bar.